If you work with clients, you must maintain pleasant appearance and you must learn how to leave good impression, these characteristics are highly important for people who work as sellers. No matter how hard you try to deny it, the look is highly important these days. Keep your hands moisturized the same way you are keeping your facial skin moisturized. When the skin of the hands and the skin around the nails is dry, then the dry cuticles come to the surface and the nails look extremely ugly, because you will start to pull away these cuticles and there is a huge chance to create wounds and scars around the nails. The trick is to moisturize the hands regularly and to exfoliate them two times per week to remove the dead cells and the dry cuticles naturally. The next thing that will make your hands look pretty is the same length of the nails, which means that you must file them every two weeks because they will outgrow. When you decide to apply some kind of nail art, you have to apply primer first. Mostly because it will protect the nails from the harsh properties of the colored nail polishes, but also because it will even out any non-even surfaces on the nails. Down below you will find a feminine and chic nail art. 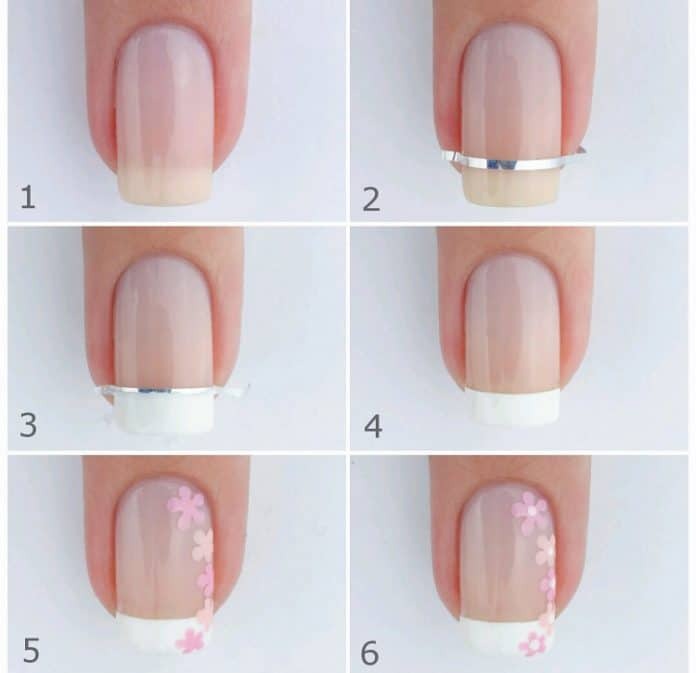 You can achieve this decoration only with the help of a dotting tool, but first apply the french manicure design. Take a look at the steps on the picture.